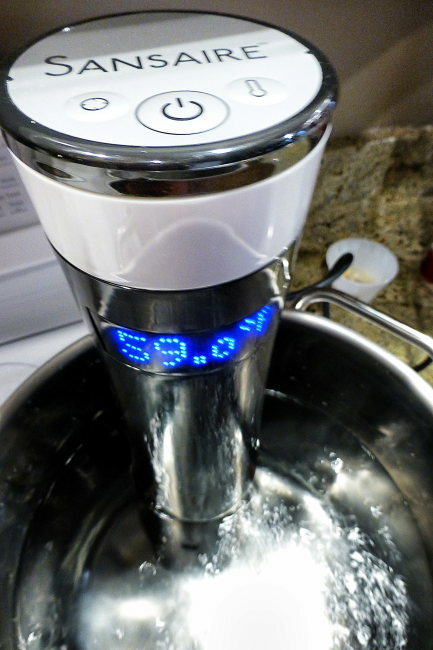 Sous vide is that boil-in-a-bag cooking method favored by professional chefs. Chefs like it because it allows them to make ahead food preparations that are consistently done to their exact specifications. The concept is that you put your food, (let’s say a nice steak), with your seasonings and aromatics (sprig of thyme, garlic, salt, pepper) in a food saver vacuum seal bag. You fill your sous vide container with water and install your sous vide water circulator, and set to the desired doneness temperature (let’s say 130F). When the sous vide water circulator has reached the set temperature, you insert the package of meat and aromatics and allow to cook. Cook until the food product (meat in this case) reaches your desired temp throughout (for steak, 45 minutes is good). The great part is it will never overcook, as it never exceeds the pre-set 130F temp. You could leave the meat in the sous vide for 3 hours with no difference in doneness. Once it’s done, you remove the meat from the water bath and the vacuum seal bag and sear the meat to get a good crust. Remember that it is already cooked, so don’t over do the sear step. This is an increasing popular method of cooking with home cooks, but still a relatively expensive kitchen tool. Not to mention the ‘floor space’ the new appliance occupies in your kitchen pantry or cabinets. Enter Sansaire. The Sansaire unit is easy to use and not huge in size (or required floor space). It’s not much bigger than a bottle of wine, and can be used in an ordinary large pot of water. It holds the temperature consistently and does a great job in a smallish package. This entry was posted in Tools and tagged sansaire, sous vide on December 3, 2014 by kritterspaw.